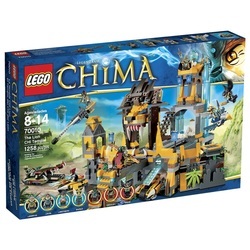 This Lego Legends of Chima: The Lion CHI Temple kit (# 70010) is another in the long line of Chima products made by Lego. 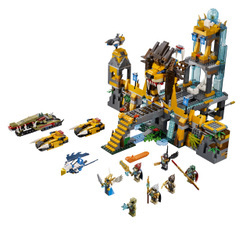 This customisable building block kit includes seven miniature figures familiar to Chima aficionados, and represents a battle between multiple tribal leaders that takes place at the Lion CHI Temple. Familiar characters from previous Lego Chi kits are present, and little builders from 8 to 14 years of age will learn patience and engineering assembling the intricate display. Let us take a step into the Lion CHI Temple and see what we can discover. 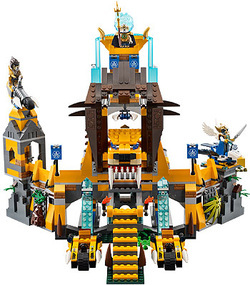 Is the Lego Lion CHI Temple a Good Buy? Depicting an epic battle, this incredibly detailed Lego building blocks kit does a really good job teaching mathematics, engineering and science technology while also allowing your child to have fun with his imagination. There are seven Chima figures equipped with weapons included in this set: Ewald, Cragger, Crawley, Lagravis, Laval, Longtooth and Razar. The fight for the sacred CHI orb is the theme of this Lego set. The Lion Temple has a working trap attached to the drawbridge, and unlike static Lego sets, many platforms and structures actually move. Building the set and the accompanying pieces teaches your child that smaller components can be combined in a certain way to create larger, movable objects, and the lion is especially detailed and amazing. The tower cannon actually rotates, and lion claw bikes and other vehicles move effortlessly. The entire kit weighs about 5 pounds, and includes an eagle drone fighter, rotating king's throne, a tower prison with a special golden key and secret ambush entrances. You can also fold the walls after playtime is over to store the kit or to display it. All in all the Lego Legends of Chima The Lion CHI Temple building toy contains 1,258 pieces, so assembly is detailed and takes some time. Not recommended for children under three or four years of age because of all the tiny parts, this kit offers a lot for its mid-level price range. The Lego Legends of Chima The Lion CHI Temple includes a waterfall, working drawbridge and traps, canons, towers and prisons, very appealing to young teen and preteen boys. Your young ones will learn a lot about technology and engineering while building this detailed and in-depth set, one that is perfect for both Lego and Chima fans.